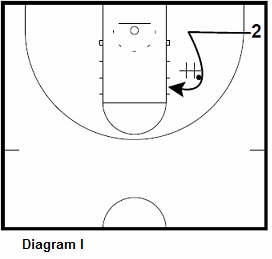 This workout features drills that will help develop your shooting guard O2. Diagram A. Player sprints up the helpline and curls around the chair (#). 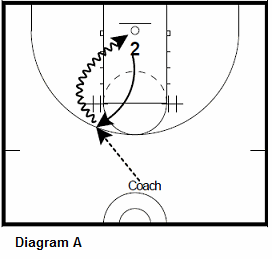 As the player curls the coach passes the ball. The player must turn the corner sharp and attack the basket. Diagram B. After scoring the player repeats the process with the other chair. Diagram C. Progression: Player sprints up the help line and makes a L-cut to the wing. After catching the ball the player attacks the middle for a layup. The drill is done on both sides of the basket. 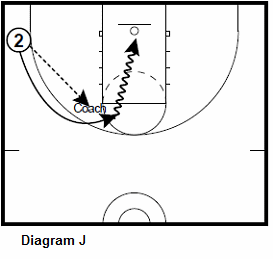 Diagram D. Guard attacks either middle or baseline. Post player rotates and shoots the guard's pass. The guard sprints to the top of the key after passing. 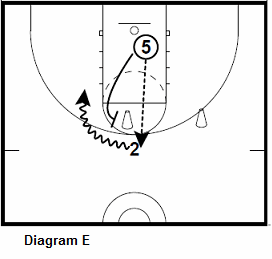 Diagram E. Post player passes to the guard and runs into a pick and roll. The guard pulls up at the elbow and shoots a jump shot. Diagram F. Guard starts on the help line. 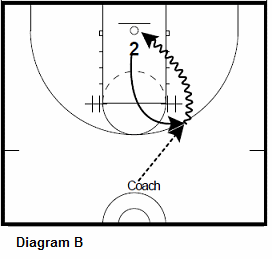 Coach skips the ball across and the guard closes out. 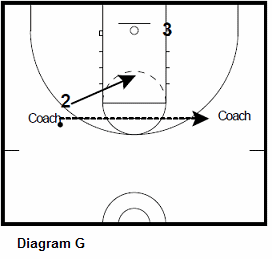 Diagram G. Guard drops back to the help line when the ball is passed back. The amount of times this happens can be varied by the coaches. 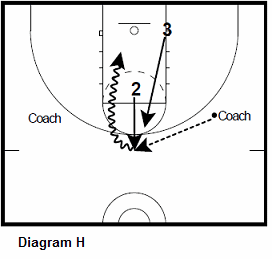 Diagram H. At some point with the guard on the help line, Coach says "score". The guard will then flash to the top of the key. At the same time X3 closes out to the top of the key. The guard rips past X3 for a floater in the paint. Diagram I. 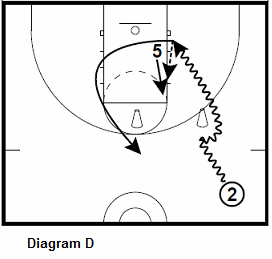 Player goes to the short corner to set up the down screen. Once there, the player sprints to take the ball off the chair (#) and curls into a jumpshot. Make 20 on both sides of the court. Diagram J. 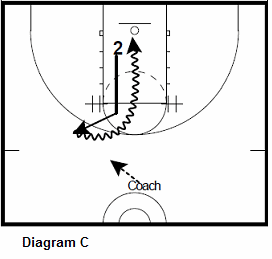 Player passes to high post and cuts to pass. 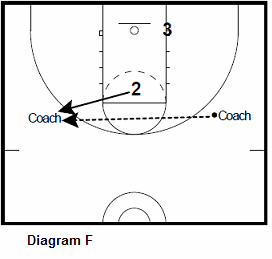 Coming off the hand off, player either shoots, drives, or takes another dribble to separate for a shot.